Welsh football's workforce and the next generation of young players now have a better understanding of the 'Welsh Way' after an exciting two-day tournament in North Wales. Sixty young players from North Wales, South Wales, and beyond, competed for the 2017 Cymru Cup, putting their hands up for selection for the next national U16 squad in the process. But beyond three compelling games of football, at Connah's Quay Nomads' academy ground, it was an opportunity to immerse everybody involved in the 'Welsh Way' of playing and working, set out in the National Syllabus. Head of Player Development Richard Williams said: "Firstly, the Cymru Cup was a really valuable experience for the players. "It was an intense few days where players had the opportunity to play, get feedback and implement that feedback. "The most pleasing thing for me was how much learning went on. "I was really pleased with the football that was played by all three teams, both in and out of possession. "We've seen a lot of really good practice, across all three groups." For the 60, 2003 born players involved, the Cymru Cup was their last contact as regional players. Around 30 of them will now be selected for the first of five national camps, in Cardiff, on August 20 and 21. Williams added: "We understand that development happens at different rates for all players. It's important that all players, their parents and clubs know that. "The 30 players who come in are the ones who we feel are ready to become a national player right now." The 2003 group will play their first international against Brittany next February before competing in a series of internationals before competing in the Victory Shield in October 2018. Williams added: "Other players will come into the group as time progresses. "If a player misses out on the first camp, he could easily come into a camp in a year's time. "It's simple. If a Welsh player is doing very well at his club, he'll have a chance to come into the international setup at some stage." 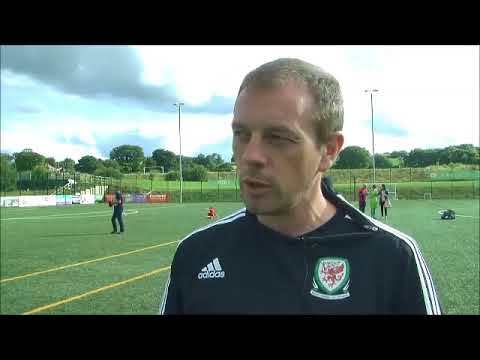 While the Cymru Cup is primarily about developing the next generation of young international players, the event also showcases and enhances the Welsh football workforce. It was an opportunity to mentor and implement the Welsh Way to the next generation of coaches from all corners of Wales. The network of scouts who make-up the expanding Talent ID department and analysts from partner universities were also schooled in the Welsh Way of working. Williams added: "We're always trying to improve our staff, in every department and at every level. "We've had an extensive mentoring programme going on for our coaches and some of the Welsh Premier League Academy coaches have joined us to see our plan in action. "Hopefully everybody involved now has a better understanding of what we are doing and can implement their learnings back at their clubs."